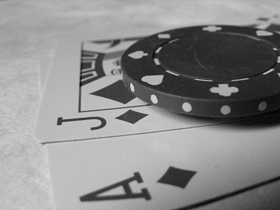 There’s no place better than at an online casino to get to grips with the game of blackjack. It’s a game that when you first play appears to be a simple game of chance with a little decision-making thrown in, but when you start to play more regularly, you’ll begin to see that you really can influence the results of the game through the decisions you take and the strategies that you choose. Often known as 21, blackjack is a game where the aim is to get a two card hand that totals 21 (Blackjack) or as close to 21 as you can get with a larger number of cards without going over 21 (bust). And in order to win, you also need to beat the dealer’s hand. The history of blackjack is long, but there were many predecessors to the game including the Spanish game of ventiuna. The author of Don Quixote, Miguel de Cervantes, makes reference to the game of 21 in one of his novels. De Cervantes was a keen gambler and in his story that features ventiuna, written in 1601, the two main characters are great cheats at the game, where the aim is to get to 21 without going over that amount. In de Cervantes’ version though, the deck doesn’t include any eights, nines or tens. Today, the choice of different blackjack games online is broad. And when you play in the comfort of your own home at online casino 32Red or any other casino site, you can try out your skills without risking any cash by playing in practice mode. At 32red the choice of blackjack games includes Bonus Blackjack, Vegas Strip Blackjack, Atlantic City Blackjack Gold and Multihand Double Exposure Blackjack Gold Online. Playing in practice mode to begin with allows you to learn when it’s best to stand, when to hit, when to split or to double down. When you start playing, these terms will sound like jargon that you don’t understand, but after a few practice rounds, you’ll get to know what they mean. That’s why it’s great to practice blackjack without putting real money down. Blackjack carries a high element of chance because you don’t know what cards are going to be dealt next, and even if you could count cards, it wouldn’t help you when playing online. But nonetheless there are plenty of different strategies that can be used when playing blackjack to improve your chances of winning some cash. And while you’re learning to play, you can check out different blackjack tutorials which will help you to see why the different choices of splitting or doubling down make sense with certain hands and not with others.